BOTOX®, is a Neurotoxin that is strategically injected into facial wrinkles to relax the muscles and minimize the presence of deep wrinkles. It’s known for greatly improving the look of moderate to severe frown lines between the eyebrows as well as crow’s feet by reducing the muscle activity that causes wrinkles to form. Botox eliminates wrinkles on the forehead and temples (specifically crow’s feet), with no surgery and no required downtime. It offers long-lasting, powerful results and is pain free. Botox achieves the desired results by blocking the transmission of nerve impulses to the muscles in the targeted area. This simple procedure prevents the muscles from receiving the message to contract and move, thus halting the further formation of wrinkles by eliminating the ability to perform actions that crease the skin. The effects of the Botox procedure are confined to the injection site and do not travel throughout the body. Botox eliminates deep forehead lines, noticeable crow’s feet and other facial wrinkles that can make you look angry, stressed and less youthful. It takes around 3 to 4 days to take effect and lasts about 3 to 5 months at a time. 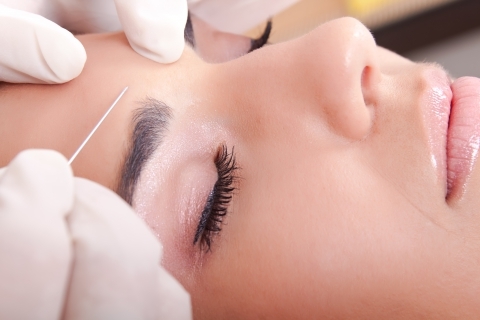 What Can I Expect During the Botox Treatment? The administration of Botox, Dysport and Xeomin injections is a 10-15 minute, non-surgical procedure. A very fine needle is inserted into the muscles on target areas of the face, quickly injecting small portions of the neurotoxin liquid. Some clients report mild, temporary discomfort from the treatments. Reach out to Dr. Bronfman Beauty to schedule your Botox treatments at either our Gramercy Park (Manhattan) or Flushing (Queens) locations today.